Life is constantly attacking me left and right with those pesky existential questions. Who am I? What am I doing? Where am I going? Questions like these can really get to you as well as an artist. The constant questioning of your purpose leaves your mind in all sorts of unholy chaos. Is the work I’m making good? Am I still passionate about my work? Am I wasting my time attempting to build a career and lifestyle in one of the most competitive and subjective fields? That last one gets to me now and then , but I can tell you that the feeling never stays because I’m constantly working to build the life I’d enjoy. Starting with my birthday this year [26 Things I Learned by Age 26]I decided to combine a few things to make a very satisfying experience. I love being around awesome people. I’ve always wanted to see that mirror effect from salt flats after a rain. 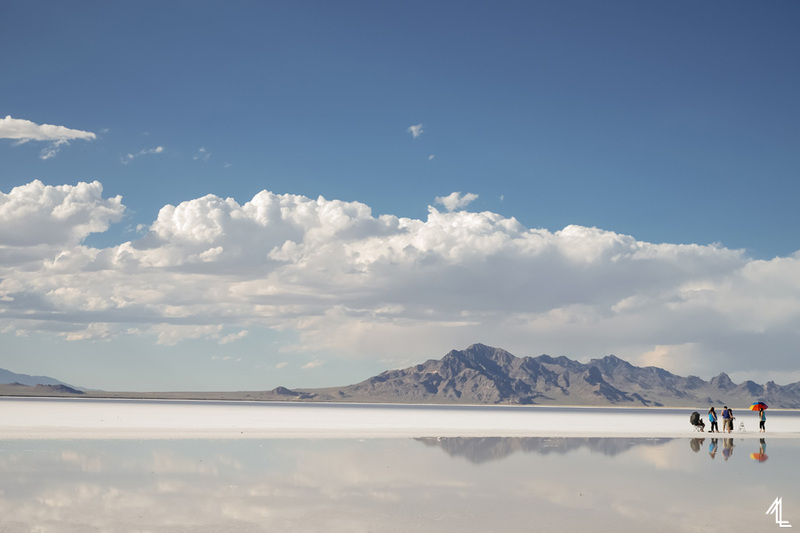 The ones in Bolivia have been exploring in popularity online, but did you know we have our own salt flats here in the states? Utah’s Bonneville Salt Flats are only a mere 2 hour drive from Salt Lake City, which is only a 2 hour flight from Los Angeles. I had to go! With a bit of Googling I found a few other hikes within driving distance from Salt Lake City to fill up a weekend with outdoor adventures. Frary Peak and Lake Blanche fit the bill! With a relative plan in motion I called up a few girlfriends from different friend groups. I think I enjoy bringing people together from different walks of life. It shows how connected we are as human beings. I brought an actress, a therapist, and a longtime college friend with me –all of whom also enjoyed seeing pretty things in the great outdoors. Together we embarked on a mini roadtrip through Utah in its 90°+ weather and 15 hours of daylight. Immediately after our plane landed my little posse and I picked up a Mitsubishi Outlander and drove out to Antelope Island State Park. The Outlander is a pretty swell crossover vehicle. Its interior is quite roomy, has a moon roof, and gets close to 30 mpg. Perfect for zipping across the great basin. First stop was Frary Peak on Antelope Island. It’s the island’s highest point and rewards those that reach its summit with a 360* view of the Great Salt Lake. It also punishes you with the most aggressive mosquitoes. Misc: There isn’t any shade and beware of mosquitoes! There a $10 entrance fee to get into the island. After that there’s an incredibly scenic, single two lanes road that takes you all around the island. You’re surrounded by nothing but water, greenery, and the occasional bison. Everything about this hike was simply charming except the mosquitoes. I kid you not about these retched mosquitoes. For me as long as I am with others that are more prone to bug bites I will never get bitten (the usual mosquito sacrifice is my younger brother.) This was not the cause on Antelope Island. My friends were brutally attack and even I had a few battle scars. Bring bug repellent if you’re going out here during the summer. Additionally be sure to apply a layer 30 minutes before you go out so that your body can absorb it. The next day before embarking on our 2 hour drive to the salt flats we did a quick search online to see if there was anything worthwhile on the way to stop by. Lo and behold we stumbled upon the Utah UP House, a real life replica of Carl and Ellie’s home from the Disney/Pixar movie. The builders even got special permission from the mouse to recreate the details from the film. Holding the film dear to our hearts –especially those initial 10 minutes that play with your heart-strings we picked up ice cream to sit on the curb and count the number of red and blue cars that drove by. If you’re looking to visit the house: 13222 Herriman Rose Blvd Herriman, UT 84096. We couldn’t go inside without an appointment, but a few other blogs managed to get inside and take a few shots. After ice cream it was straight to the salt flats. I’ve been dreaming of visiting an incredible nature spectacle like this and luckily my girls and I picked a timely weekend for a visit. It rained earlier during the week that created a giant mirror effect from a giant, shallow pool of water. Bonneville Salt Flats are the result of Lake Bonneville drying up years ago and is known for land speed records on its speedway. To get there you’ll drive 2 hours west from Salt Lake City on the I-80. I put the Outlander on cruise control for the most part. A single strip of road was a commonality on our Utah trip. When you think you lost because you’ve been going straight for so long it, it’s probably the right way. I’ll admit I wasn’t 100% sure of the salt pan’s exact, pinpoint location since our cell phones and GPS lost service. On the way though we run into the 87 foot tall concrete sculpture by Karl Momen titled Metaphor: Tree of Utah or sometimes called Tree of Life. It reminded me of the Sudowood Pokèmon. Other travel websites and blogs mentioned that Metaphor was along the way. Once we were done admiring and taking photos with the giant concrete orb tree the four of us jumped back into the car and continued for another 15 miles west down the interstate. There’s a rest area out there were you can safely pull your car over, park, and enjoy the salt flats. We traveled over 700 miles from Los Angeles to frolic in a salt pan. On the last day of our Utah excursion I held up two photos of potential hikes to go on. One was of a couple standing in the summit of Mt. Olympus the other was of a girl’s shoe perspective facing a giant lake. We’re stuck in a never-ending drought in California, so seeing a body of water occurring naturally is magically bewildering for us. We decided on hiking up to Lake Blanche. Its trail was extremely green and very well maintained. The entire trail consisted of a narrow dirt road that cut right through the trees and up into the mountains. Some rock scrambling is involved, which meant plenty of high places to climb up and take photos literally on the edge for me. The trail is rated to be demanding and difficult since its one trail consistently goes uphill. However how can you deny yourself from seeing a hoard of healthy, thriving green trees; a huge lake complete with multiple waterfalls; and even snow?